The backhoe loader is mainly comprised of powertrain assembly, wheel loader unit and excavator unit. It is typically designed for special kinds of work. The three parts are all quite necessary when operators want to finish their work in special working environment. As the core part of backhoe loader, the powertrain assembly makes it possible for the backhoe loader to normally operate on various rugged terrains. Installed in the front of backhoe loader, the wheel loader unit is mainly used in picking and carrying a large quantity of loose materials, bulldozing and ground grading. As the major component of backhoe loader, the excavator unit can be used to excavate dense and hard materials, especially soil. It can be also used to lift heavy stuffs in order to carry them to the target places. It mainly consists of movable arm, bucket rod and bucket. When the backhoe loader is working, the stabilizing feet can absorb the impact caused by weight, which can prevent the downward force caused by the operation of loader from damaging the wheels and tires. In this way, the backhoe loader can remain stable during operation and the impact force during excavating can be minimized. 1. It is fitted with reliable genuine Cummins engine. 2. 4 forward & 4 reverse synchromesh mechanical shift transmission have been designed for this backhoe loader. 3. The combined seal cylinder ensures high seal performance and more reliability for it. 4. Obviously improved loader and backhoe performance. 6. Larger new-type cab helps to increase comfort and visibility of this backhoe loader. 7. Both of 2-wheel driving and 4-wheel driving are available. 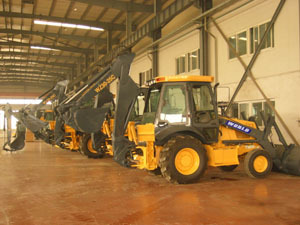 World Equipment is a professional manufacturer and supplier of backhoe loader in China. Our products have been quite popular in Europe, South America, Middle East, Southeast Asia and Africa, etc. In the past 10 years, we have been kept improving our products to make them better adapt to the market. If you need backhoe loader, we will provide a competitive price for you. Don't hesitate, please contact us.